The catalyst market. Cards slide and get cheaper as cards get purchased. In the future, the world is in chaos, and it’s up to you to harness the power of superhuman catalysts to bend the nations to your will. How will you enlist their help? Money, of course. And by being very efficient. Catalyst is a combo-driven tableau-building game for two to four players. Players are factions trying to harness the power of superhuman “catalysts” to rise to supremacy. The player with the most points wins. 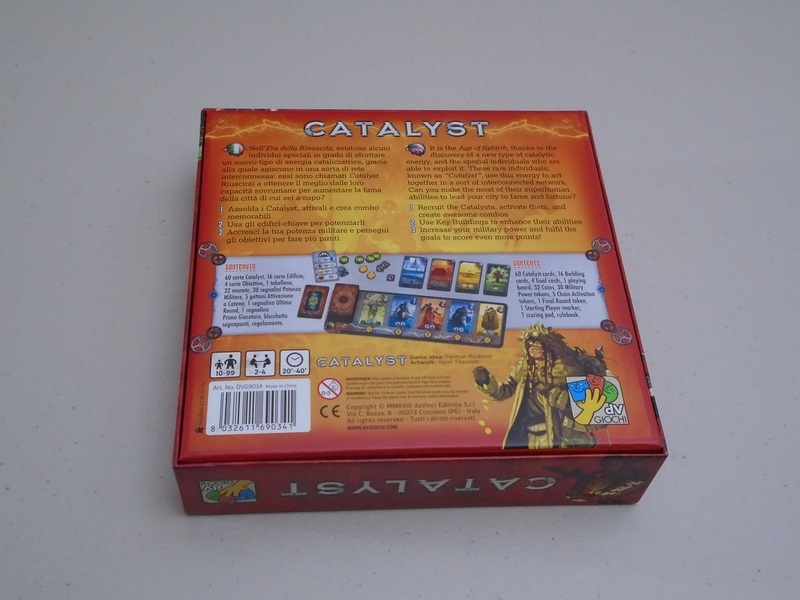 Catalyst set up for three players. To begin, the catalyst deck is shuffled, and ten cards are set aside. Then one card is placed on each of the market spaces on the catalyst market board. 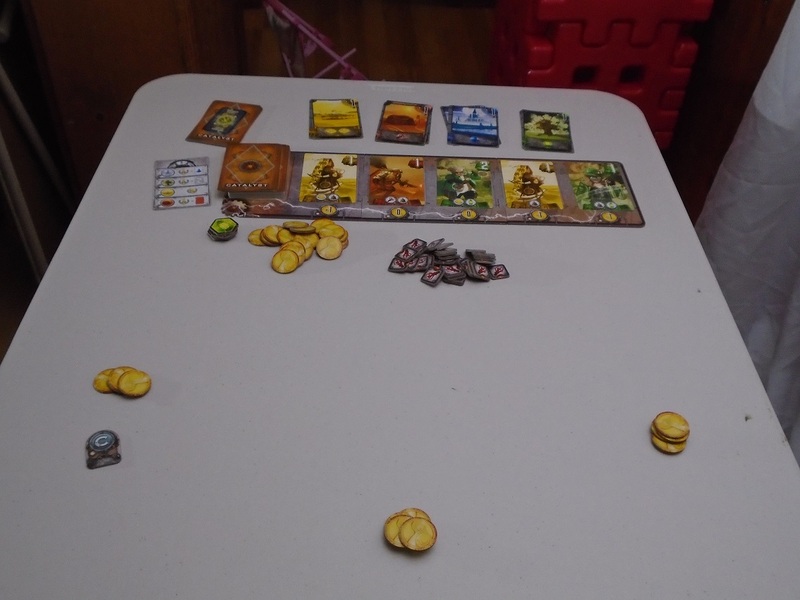 Each player receives money tokens by seating order, and the buildings are sorted and placed in ascending order by cost. A building scoring card is chosen. Play begins. On a turn, players may do one action. They may either collect contributions, recruit a catalyst from the market, or activate one of the catalysts in their tableau. Activating catalysts is the heart of the game. Each catalyst has at least one icon on it indicating an ability when activated. Abilities include recruiting another catalyst, constructing a building, earning coins or warfare tokens, or earning lantern tokens, which allow the player to activate another catalyst this turn. When a catalyst is activated, it’s turned sideways to indicate it has been used. After the catalyst’s power is activated, if that catalyst is in a building, the building’s power is used. Once a player is finished activating catalysts, any used catalysts are placed face-down into a personal scoring pile, and any catalysts that weren’t used move to occupy any vacant buildings. 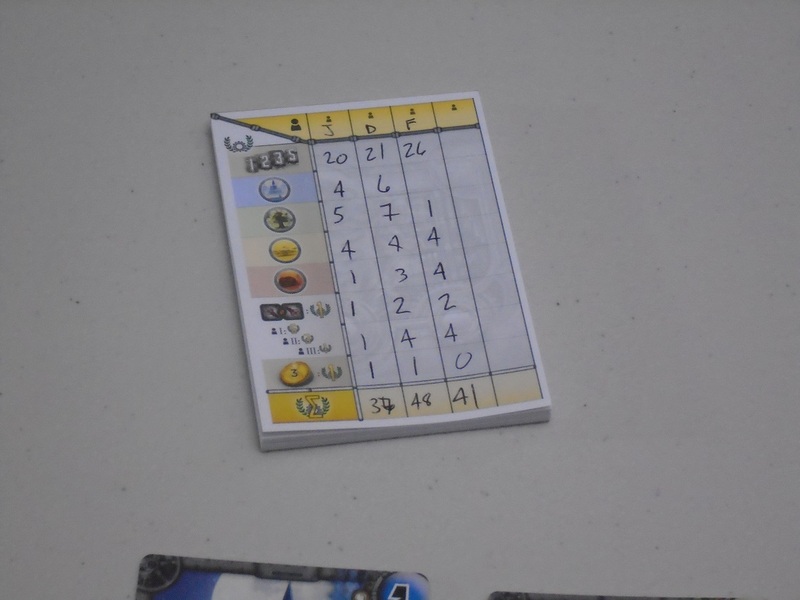 At the start of the game, a scoring card is revealed, which tells how each of the building types scores points at the end of the game. The game ends when the deck of catalyst cards runs out. The round is finished, and one more round is played (the ten set-aside catalysts are used to replenish the deck). 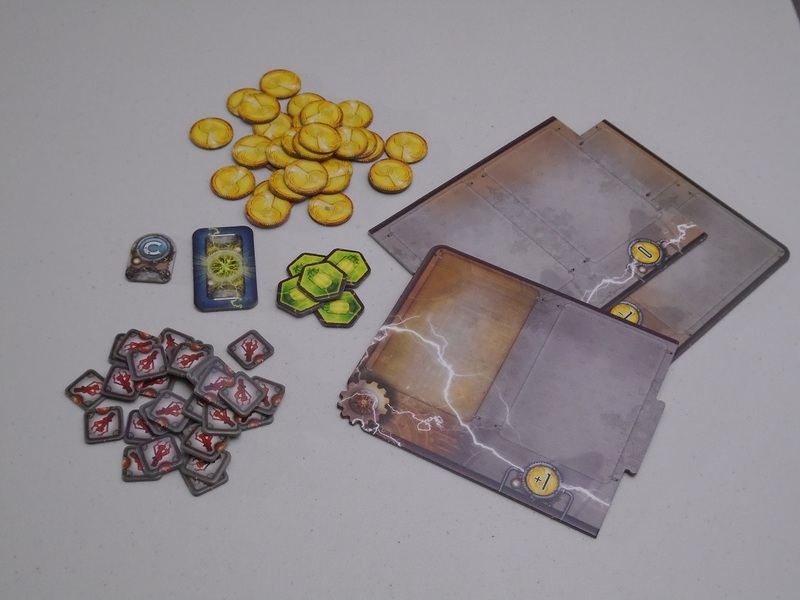 At the end of the game, players score points for the catalysts in their score pile and the variable scoring conditions for the buildings they’ve constructed. 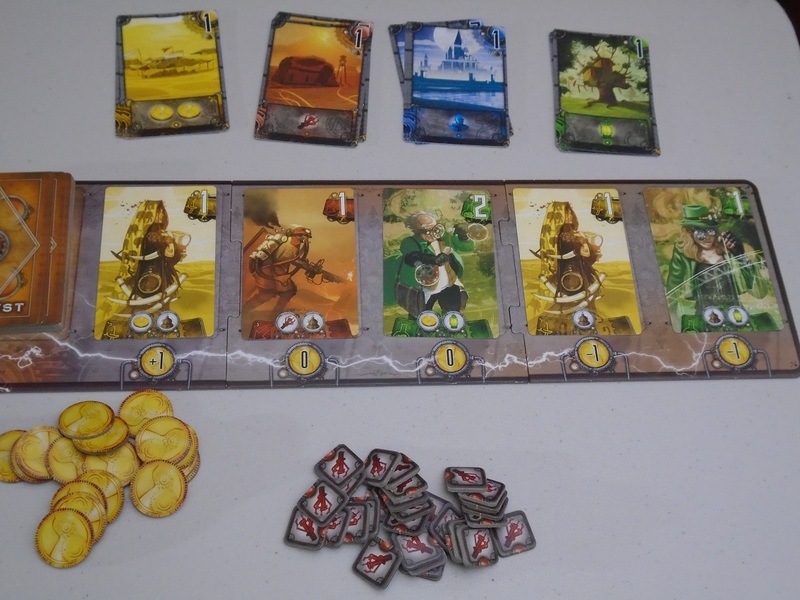 They also score points for their warfare tokens–both a base value and in comparison to the other players. The player with the most points wins. 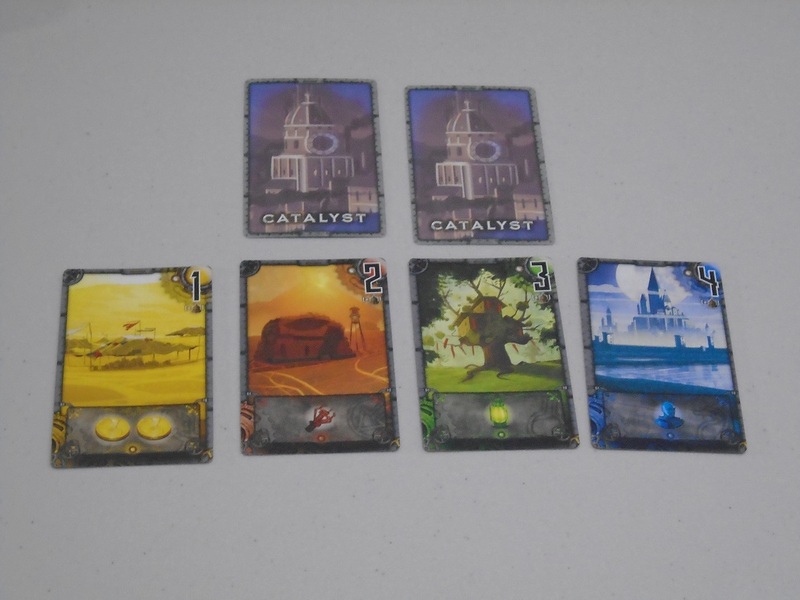 Catalyst is a micro-turn efficiency game that feels cut from the same cloth as Splendor. While Splendor is an engine-building game distilled to its barest essence, Catalyst is a pared-down combo-building game. 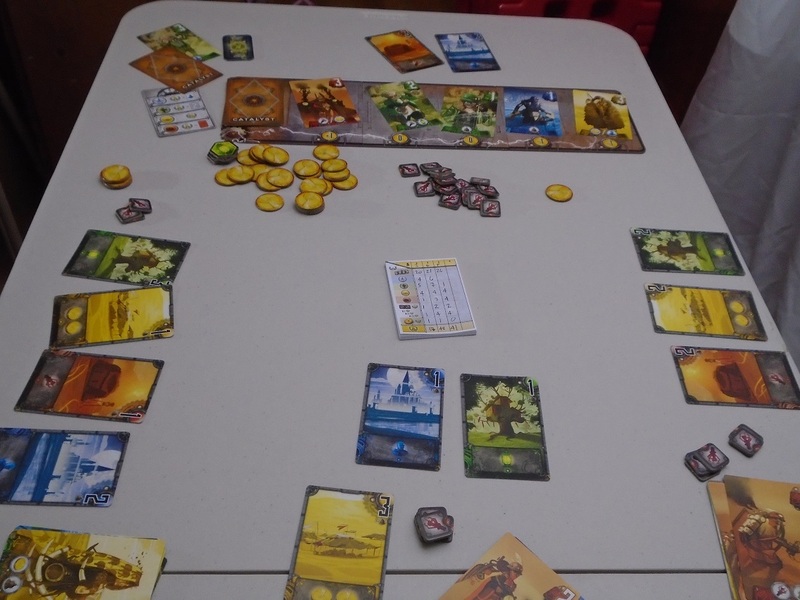 Each game revolves around quick decisions and quick turns, minimizing thematic backdrop in favor of an almost Zen-like gameplay flow. For me, this formula worked in Splendor, yet I find it less compelling in Catalyst. Catalyst is a decent game, but it ultimately lacks the addictive quality that makes me want to keep coming back for more. I’m realizing that combo-driven games are more of a mixed bag for me than I would have thought. I cut my gaming teeth on CCGs, and Glory to Rome and Dominion are my top two favorite games. I love finding a way to put disparate elements in service of the same goal. Yet the recent spate of pared-down combo-driven games hasn’t done it for me. I thought Potion Explosion was too open (and thus unsatisfying), and while the recent release Gizmos is decent, I find it a little generic: there’s no real sense of what you’re doing or why. Catalyst feels the same: it’s a decent, albeit too generic, entry into the genre. 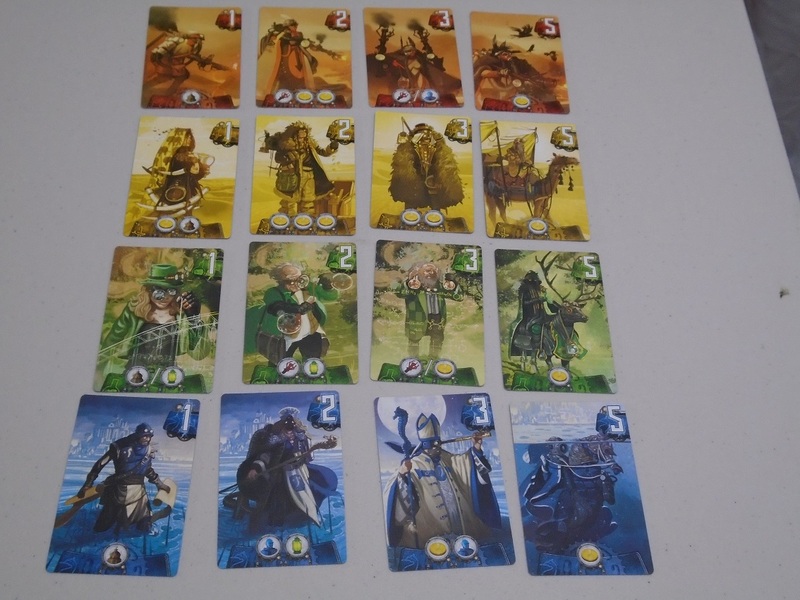 What draws me to my favorite combo-driven games is a sense of narrative or specificity–not theme, necessarily (see: Dominion), but you want to be able to show off your creation at game’s end and discuss after the game how you put together these specific cards or those specific conditions to pull out the win. Catalyst lacks this sense of specificity and narrative. While the illustrations in the game are nice and are clearly intended to evoke a larger world, the cards, the factions, and the powers do not feel differentiated enough to give any sense of grounding. Catalyst toward the end of the game. One can argue the same about Splendor, I realize. There are no names for cards in Splendor, and the art is similarly beautiful but generic. This is true, but I think what Splendor has going for it is 1) the cards you acquire for your engine are simply discounts on other cards (they’re permanent currency–they don’t really need to be differentiated), and 2) the setting is real-world; while it’s generic, it’s understandable that having some kind of mine would produce the necessary resource for obtaining further resources and points. In Catalyst, the cards hint at a larger story, but ultimately do mundane tasks, and the futuristic fantasy setting offers no handholds for making any sense of what you’re doing in the game. While the large-form cards in Catalyst are beautiful to look at, the futuristic widget icons could be almost anything else for all they do to situate players within the realm of the game. The building cards in Catalyst. These stay in a player’s tableau for the rest of the game. Personality is a driving force in a game where combos are important–both the individual personality of the various items to be combined and the personality of the player who combines them. Catalyst values ease of play above all else–there are just five icons in the game–but loses its personality, its soul, in the process. Because there are so few icons, and because there seems to be little rhyme or reason to the way these symbols are distributed across the catalyst cards (even cards of the same suit and rank have different combinations of icons), there’s little differentiation between what one player does and what another player does. That being said, there is some small variety between player strategies introduced through the buildings in the game. 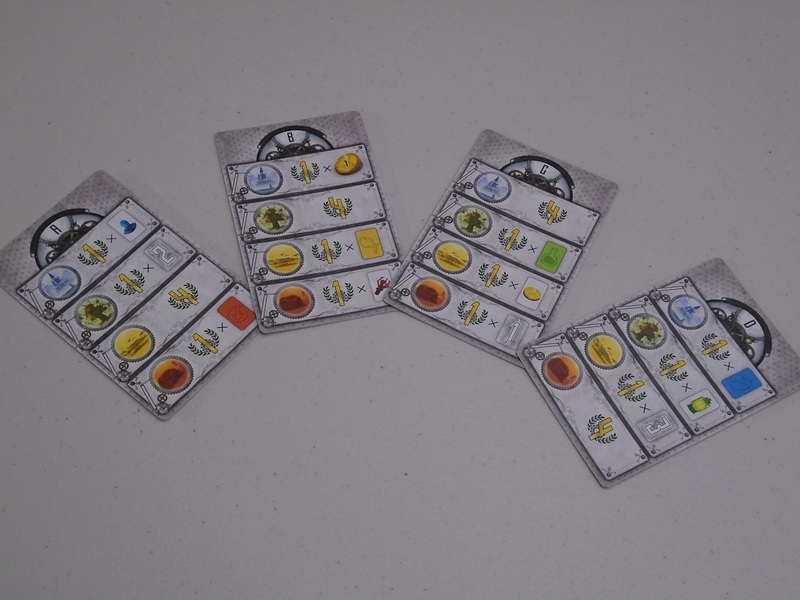 Each player can own only one of each building, and at the end of the game, each building will score differently based on a scoring condition card revealed at the start of the game. Ideally, each player would love to have all four buildings, but as buildings are purchased, they become more expensive, so players may try to hammer one or two scoring options for the game. The catalyst cards. The illustrations are well done but, really, could be anything. The first building a player builds might also set their course. A green building allows you to form larger action chains for efficient turns. Blue allows you to recruit more catalysts at the end of an action. Red lets you collect warfare tokens for points at the end of the game. And yellow refills your coffers after taking an action. All of these are good bonuses, and each has its benefits. But like the rest of the game, they’re all pretty equally decent, and it can be hard to determine which benefit will be most useful. Even if you decide based on a scoring condition, it can be hard to know which scoring condition is likely to pay off best for you at the end of the game. A lot can change in the market between one turn and the next, and because the buildings provide the same benefits for everyone, there will be stiff competition for most cards that satisfy the scoring conditions. Really, Catalyst is a game of opportunism and tactics, trying to make the best of what is happening at any given time. And for that reason it falls into the “tastes great; less filling” category for me. The game flows well, turns are brisk, and you get to put together chains that occasionally let you feel like you’ve had an efficient and productive turn. It tastes great in the sip test. The game comes with a scorepad. But then you score the game, and you realize that even though the players took different paths, the scores are…just about the same. You dig deeper and upon reflection understand that the building bonuses are all about equal in value. You realize that in a game of micro turns and micro efficiencies, especially where there’s little strategic guidance and most options are so balanced as to be mostly equal, most of your decisions don’t feel like they really mattered. So while the initial taste is good, you walk away still hungry for something. Catalyst isn’t a particularly deep game. 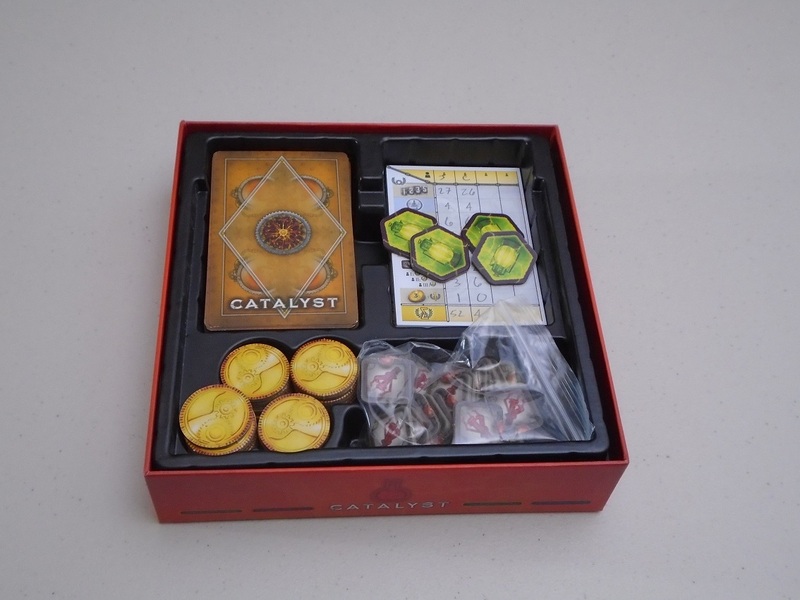 The cardboard components in Catalyst are very well done. And it isn’t meant to be. I don’t mean to be too harsh with Catalyst: it’s decent, and I think some players will enjoy it, especially if they take it for what it is and don’t examine it too closely. It moves quickly, and again, it’s satisfying to put combos together and have efficient turns. There’s just little that will differentiate one session from the next. There’s little reflection that players can do that will help them play better in the next game. You’ll take the next game as it comes and do your best to pull out the win. Not every game needs to have depth. I just wish there had been more to this one. The insert holds everything in place. The components in Catalyst are very nice. There are five pieces of art for each of the four suits (including buildings), and these are well done. The cards are large and showcase the artwork. The tokens are on thick cardboard, and the puzzle-piece market board works well. Everything fits into the box great. The box says it plays two to four players. I thought the game was more interesting with more players, mostly because more bodies at the table kept the talk going. This is also a game that is better played fast. The back of the box explains the story…which doesn’t matter at all to the gameplay. 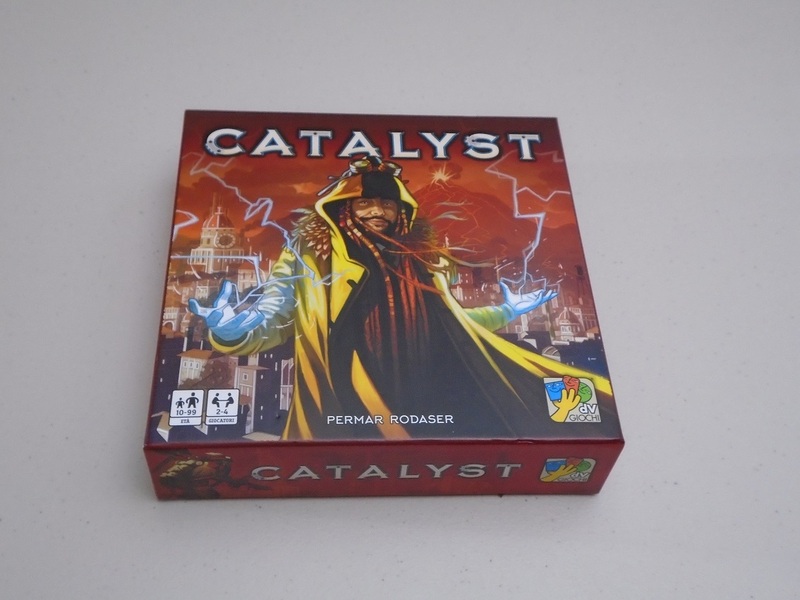 Catalyst isn’t a bad game, and if you don’t have my hang-ups with personality and balance, and you would like a game like Potion Explosion but with less rules overhead and faster playtime, you might like it. For me, I think it’s a little too smooth and too generic, and it’s not one I’m eager to keep playing. iSlaytheDragon would like to thank dV Giochi for providing us with a copy of Catalyst for review.